We present an augmented reality system that integrates needle shape sensing technology and a visual tracking system to enable a more effective visualization of preoperative MR images during MR-guided needle biopsy procedure. 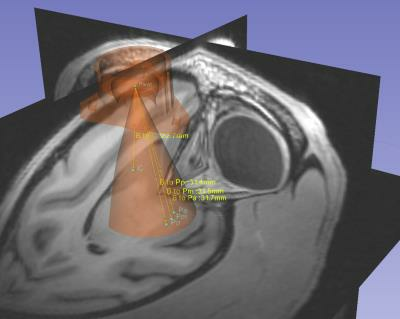 It allows physicians to view 3D MR images of targets within the patient fused onto the patient anatomy as well as a virtual biopsy needle registered to the real needle. This provides what-you-see-is-what-you-get interaction even after the needle is inserted into the opaque body and can improve on current MR-guided needle biopsy by providing a faster tracking, and by enabling real-time interactive procedures based on pre-acquired scans, thus avoiding costly MRI scans. In this work, we present a new version of our hydrostatically actuated system and investigate its accuracy and time efficiency for real-time MRI-guided targeted needle placement in a motion phantom. 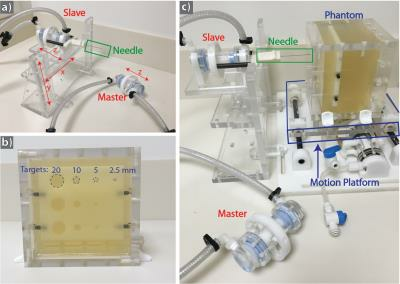 We show that actuator-assisted needle placement was able to reach the targets with greater accuracy and in less time than free-hand step-and-shoot placement for both static and simulated respiration motion. Our new rolling-diaphragm hydrostatic actuators can potentially enable physicians to remotely perform real-time MRI-guided interventions during motion. We develop a multiple degree-of-freedom robotic controlling system to target brain nuclei in the rat brain inside the high field (14.1T) MRI scanner. This MRI-compatible robot arm provides high targeting accuracy by using MRI images as a feedback to guide the brain intervention. Meanwhile, an MR-compatible camera-monitored insertion trajectory can be optimized through the controlling software in order to investigate the effectiveness, safety and feasibility of deep brain nuclei targeting for translational application. We present an intraoperative MRI protocol for stereotaxic surgery to precisely deliver induced pluripotent stem cells to targeted locations within the brain of a non-human primate model. Previously, these surgeries were performed in stereotaxic operating rooms with no intraoperative imaging, or in a conventional MRI system without real-time guidance. Those environments complicate the goals of ensuring precise cannula tip placement before injection, and being able to perform the desired number of injections during the anesthesia window. Our platform enables surgeons to quickly achieve precise tip placement, and confirm via imaging that cells were deposited at the intended target. Inductively coupled RF coils have been used as markers for MR guidance of endovascular catheters using lumped elements, and a monopole antenna could be used as a marker that is more compact and easy to build. We built three prototypes for 3T, acquired GRE sequences and B1+ maps in two orientations, and modeled electromagnetic fields using low and high permittivity dielectric coating on the monopole. Measured Q-factors were 7.6–11.7, scaled experimental B1+ of marker signal were 198–272%, and modeled electric fields were reduced. This work demonstrates feasibility of a monopole antenna as a wireless marker for interventional MRI. 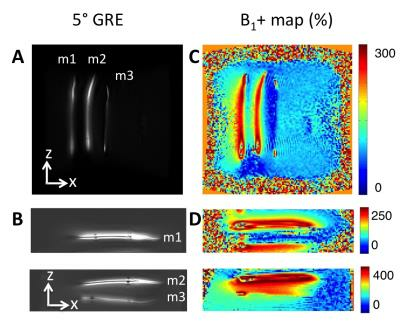 It is demonstrated that parallel transmit (PTx) can be used to both safely visualise tissue (no heating even from high SAR sequences), and safely visualise a wire by direct coupling using low power MR sequences. A low power version of a TSE sequence was found to give the best depiction of the wire when using this method. Accurate visualization of catheter tip is important in MR-guided interventional procedures, in particular in the coronary arteries where the tip orientation is essential to introduce the catheter into the target vessel. Active catheters generally provide a positive MR signal around the tracking coil at the tip. In this study, an operator-controlled variable attenuator is attached to an active catheter to enable rapid manual adjustment of the tip signal by the operator. The system was tested in an animal experiment at 3 T, and the active catheter was successfully introduced into the left coronary artery multiple times. Interventional cardiovascular magnetic resonance (iCMR) can enable radiation-free catheterization procedures. However, the lack of MR-safe devices limits clinical iCMR procedures. An MR-safe, metal-braided catheter that avoids RF-heating at 1.5 Tesla was prototyped. RF-heating of the device was eliminated by virtue of segmenting its metal components. RF-safety and mechanical integrity were confirmed through in vitro tests per ASTM standards. 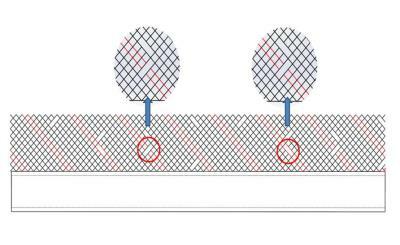 The proposed method could be an attractive technique to construct MR-safe metal-braided catheters for iCMR procedures. Cardiac MRI-guided catheterization offers an alternative to conventional fluoroscopy. This technique has been used in congenital heart disease for diagnostic purposes using passive tracking methods, with either CO2 or gadolinium filled balloon wedge catheters. The gadolinium filled balloon is easier to visualize. 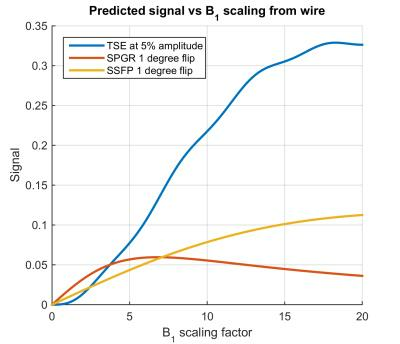 The sequence, real-time bSSFP, can be used with or without saturation prepulse, leading to either suppression of soft tissue signal or poor catheter visualization. We have developed a partial saturation pulse sequence providing high contrast between tissue, blood and balloon. After optimization in phantoms and volunteers, this sequence has shown excellent results during MR-guided catheterization in patients. RF and Cryo ablations are being increasingly used for treatment of cardiac arrhythmias. LGE-MRI is widely used for characterization of RF and Cryo lesions. However, LGE-MRI requires contrast injection. Recently proposed native T1w techniques are only useful for visualization of acute (< 3 days) RF lesions. T2* relaxation time of RF and Cryo lesions significantly changes with time after ablation. T2* time of ablated myocardium is considerably lower that T2* time of normal myocardium after 1 week post-ablation. A native T2*-weighted MRI technique which can be used to visualize both RF and Cryo lesions has been developed and validated in animal studies.